June Cleaver. Harriet Nelson. Donna Reed. And all the other women in those vintage commercial ads from the Golden Age of Television. What do they have in common? Any guesses? Well, it's true they represent a different time, where TV made it look like there was nothing a wife ought to do but greet her husband when he got home from the office, and bake cookies. Endless, endless cookies (yum, though). But that's not what we're talking about, and you know it. All those gals, every one of them, just oozed style. They took care of business with a sense of "cool" we modern folks just can't match in anything we do. And they looked glamorous doing it, too. This Halloween, bring back their style in the women's polka dot housewife costume! This darling dress is deceptively simple and elegant. As you can see, it's a lighter blue with eye-popping polka dots, complemented by a white apron. As if those features didn't pack enough retro charm, the gown's peter pan collar (yes, that's what they're called!) immediately evokes '50s fashion. It's subtle and yet ravishing. This costume is also ideal for accessories, including a pearl necklace, high heels, and anything else you dream up. We've got all the finishing touches here. No matter what they say about the 1950s, we all have to admit that it's a shame the styles left us when the decade did. 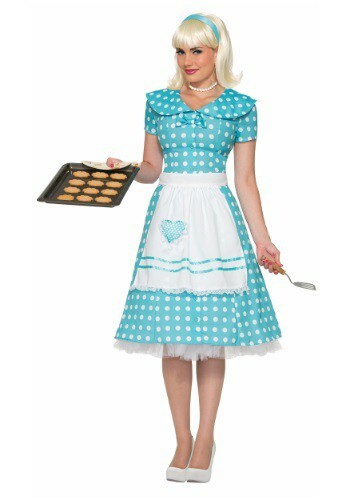 So this Halloween, make a fashion statement no one can disagree with in the women's polka dot housewife costume!